Lake Marine & RV is Woodstock’s one-stop marine & RV facility. Conveniently located just south of Rt. 14 and Rt. 47, Lake Marine & RV can take care of your boating and RV needs whether you’re on your way to or on your way home from a weekend of fun! We have new Veranda Pontoon, Lowe Pontoon and fishing boats, and Rinker boats in stock, and are also McHenry County’s authorized Wolverine Trailer and Karavan Trailer dealer and offer competitive pricing and fast delivery on all of their models. Lake Marine & RV also offers storage for your boat or RV! We have a 7 acre outdoor storage yard, a 44,000 sq. ft. indoor heated facility, and a 6,000 sq. ft. indoor cold storage facility. Don’t trust your boat or RV to some pole barn in a farmer’s field! Keep it safe in our secure, clean concrete floor storage facilities! 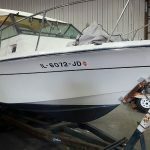 We have a full line-up of boat, RV, and ATV repair and maintenance services — from tuneup and drive repair, winterization, upholstery and carpet replacement, fiberglass repair and restoration, paint and gelcoat repair, and much more! Our technicians are trained and certified to work on Mercruiser, OMC, Volvo Penta, Johnson/Evinrude, Yamaha, Force, and Seadoo equipment.